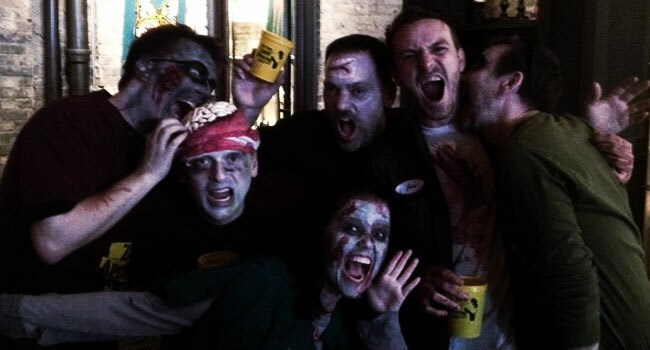 Enjoy braiiiiiins and drink specials September 27th with the 2nd annual Bay View Zombie Apocalypse Charity Pub Crawl! The zombie path of destruction will include Backyard, Boone & Crockett, The Highbury Milwaukee, Tonic, Studio-Lounge and Hamburger Mary’s. Tickets are available for purchase in advance right here, and include a souvenir Zombie Pub Crawl t-shirt and an event cup for the drink specials. All proceeds from the crawl go to Ruthie’s Kennel Club and AIDS Walk Wisconsin! Registration will be at Hamburger Mary’s starting at 3:30pm. From there, the hordes of zombies will be led on multiple routes to participating Bay View bars.